Stamp collectors have been using stamp albums to store, organize, and protect their stamps for more than 100 years. And, there is a huge choice of different stamp albums – loose leaf, bound, by country, by theme, hinge, hingeless, mounted, etc. It can be very confusing. But, before you go and buy a stamp album, you need to decide what stamps you are going to collect and how serious a collector you are going to be. You can choose to collect stamps by a certain country (American stamps, British stamps, etc) or be a topical collector (also known as thematic - you can collect bird stamps, space stamps, Princess Diana stamps, and much more). Also, before buying, think about how big your stamp collection may be in the future. Are you only going to collect a few stamps, or are you going to build your collection over a number of years? If you are going to be a serious collector, you do not want a small stamp album that you will quickly outgrow. One other important consideration is the quality of the album. Stamp albums that use acid-free paper, free of wood fibers, with sturdy pages and a strong cover will provide the best protection for your collection. 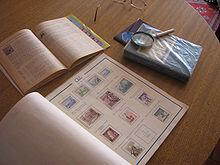 A popular type of album is where the album has printed pictures of the stamps you choose to collect (by country or theme); the pictures may be in black and white to make it easy for you to quickly identify the stamps you are missing. They will be the same size as the stamp and will have a brief title to help you identify the stamp. However, you can choose an album with blank pages, so you can arrange the stamps in an order that makes sense to you. Also, you can choose between hingeless stamp albums or a hinge style album. A hinge album is cheaper. However, attaching to the album is more difficult, and you may damage the stamp if not done correctly. Stamps should not be glued or taped to the album, as this destroys the value of the stamps. Hinges are relatively cheap. Hingeless style stamp albums use clear plastic pockets or mounts to keep the stamp in place and to protect them from harm.